Read-out Instrumentation Signpost: UPS for tile manufacturer. Peronda, a leading Spanish ceramic tiles manufacturer, has chosen Delta’s high-efficiency Ultron DPS series Uninterruptible Power Supply (UPS) to protect their mission critical applications. 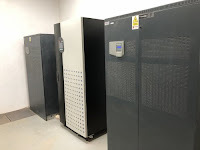 The project of the replacement of Peronda’s UPS was born after an efficiency and comparative study of 3 installed 200 kVA UPS vs Delta’s Ultron DPS 200 kVA UPS with real measurements in Peronda’s facilities. The installation of the new Delta UPS improved the current performance from 90% to 96% and a considerable improvement in the input harmonic distortion (iTHD) due to the patented three-phase PFC system, which achieved a very interesting TCO for the customer with a payback in less than two years due to energy efficiency. The strengths of Delta’s UPS were the DPS series technical characteristics focused on the industrial world with a very wide input range, and Peronda’s performed tests at Delta’s facilities in Madrid which were very satisfactory. The UPS protects the furnaces and the ceramics production line; these furnaces must be working 24/365. In the event of power blackout, the ceramic manufacturing process could come to a halt and cause high costs due to production loss, high costs due to furnace maintenance, and a waste of employee time. It is also worth noting the installation of 6 Delta’s Ultron HPH 30 kVA UPS to protect the printers that decorate the ceramic. A power blackout would also cause production loss here. To Peronda, the implementation of a reliable and efficient power backup solution was a critical task to prevent waste of material and person-hours while maintaining targeted production output. Finally, for this leading manufacturer of ceramics, both the Ultron DPS and the Ultron HPH solutions were a success. Without additional hardware, Ultron DPS and HPH Series UPS also offer a flexible and convenient way to expand the total output power to fulfil business growth.